Step 1. Wash apples and remove cores. Step 2. Slice each apple into eighths. Push skewers into the base of each slice. Step 3. Melt chocolate in the microwave or over a double boiler. Step 4. 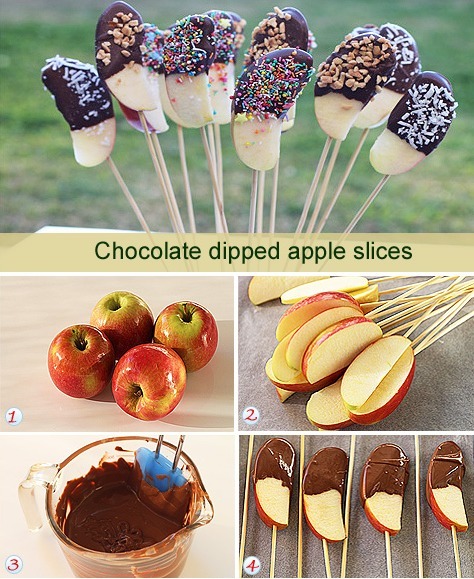 Dip apple slices in chocolate and lie on a baking paper covered tray. Decorate with sprinkles, nuts or shredded coconut and serve. To melt the chocolate in the microwave, place chocolate melts in a glass bowl and heat on high for 1½ minutes. Stir and then return the bowl to microwave for 15 second bursts until it is entirely melted. It is important to stir well in between stints in the microwave as the glass bowl has residual heat that will melt the chocolate. If you are in a warm climate or it is a warm day, you’ll need to place the dipped apple slices in the fridge to set.